The Judi Meadows Memorial Fund is supporting a new PhD studentship with Exeter University on GPs and suicide prevention. The PhD student, Daisy will be working with Professor Rose McCabe at Exeter University to develop new ways to help GPs spot people at risk from suicide and how to support them. We have part funded this studentship and are currently fundraising to support a second fellowship. Evaluating the impact of South London and Maudsley’s “Wheel of Wellbeing”. This is alongside our ongoing evaluation of their Recovery College. With world mental health today on 10th October 2016 focused upon psychological first aid, both of these projects have learning to draw upon. Wellbeing is a growing theme in our work and we have been working over the summer to evaluate Kent’s “Healthy Living Centre’s”, building on our existing work looking at their wider wellbeing programme. There is a commitment across the public sector to build an evidence base for mental health promotion and prevention. We look forward to seeing the impact of our reporting locally, as evaluations are delivered to support learning and programme improvement. We have also been helping academic teams with bid preparations for research funding. We are always keen to form new partnerships, developing patient and public involvement plans with university research teams. News coverage of topics we are working on such as antibody mediated psychosis is great to see, raising awareness of mental health research. Finally we have just been commissioned to help Macmillan Cancer Support’s Cancer and Mental Health Taskforce to develop a ‘theory of change’ for th eir work. 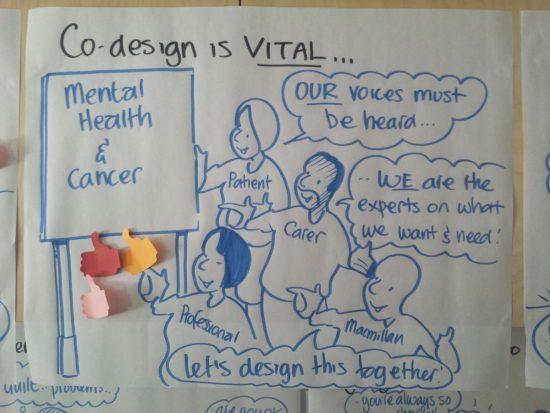 It is great to work outside of our mental health sector joining mental and physical health. What else? We say a big thank you and farewell to our volunteer Ali and Administrator Annabelle, we wish you well and are grateful for all their hard work. We also published a new ‘Methods Paper’ looking at the impact that being survey champions had on the service users who took on that role as part of last year’s ‘Your Experience in Mind Survey’. It demonstrates some ways that involving people with lived experience of mental health problems in such projects can have a positive impact on the participant’s wellbeing, as well as improving the quality of the output for the commissioner. We continue to support the involvement of people with experience of mental illness in studies across the country. Currently highlights include preparations for a major project on young people’s mental health, and information materials for people with antibody mediated psychosis.